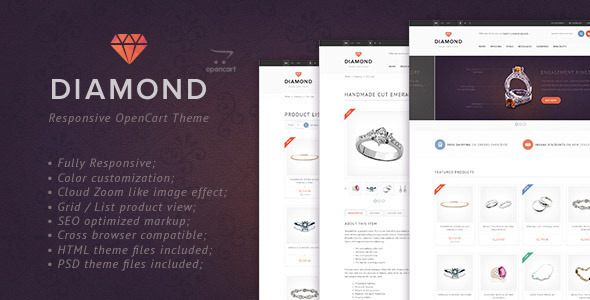 Â«DiamondÂ» is the OpenCart template, which is made in a clear & modern style. Keeping pace with the times we offer a truly high-quality solution. Combined with a thoughtful and carefully elaborated design, Â«DiamondÂ» will leave no one to be indifferent. Using this theme you can not only increase conversions quality and number of positive reviews but also make a pretty good surprise to your customers. In order to improve customer support all future questions related to this subject please write us on our SUPPORT SYSTEM. Support requests in the item comments will not be taken into account.